At the mineralinos’ Christmas party this year we will deal with a mineral, which many of you didn’t know was one. Snow! Together, we will try find out what fascinating things hide behind this cold mineral. At their Christmas celebration, the mineralinos research an exciting “mineral” – snow! On Monday, 16 December, at 4 pm, the mineralinos – terra mineralia’s childrens’ club – come together once again for a companionable afternoon at Freudenstein Castle. At this year’s Christmas party, the mineralinos are going to learn all about a special mineral – and many of them probably don’t even know that it is a mineral. Snow! We are going to investigate the fascinating facts that hide behind this cold mineral, and try to find answers together. In the “Research Expedition” – the scientific centre of the exhibition – the girls and boys will have the opportunity to learn all kinds of interesting facts about snow. Children love snow, which is not always the case with adults. But how is snow formed and what makes it so special? Snow consists of ice crystals. But when it snows, we usually don’t see individual ice crystals, but rather snowflakes. If you examine these crystals under the microscope, you will be able to see that there are well over a hundred different characteristics that can form in different positions all over the crystal. These combinations allow for the formation of countless different shapes. That’s why the number of different shapes that snowflakes can have is higher than the number of atoms in the universe. You will find out about the impressive shapes that can be found and you will also learn everything else you need to know about snow if you join the mineralinos for this exciting event. The mineralinos meet at the terra mineralia cash desk at Freudenstein Castle. For more information, please contact the Info Desk on 03731 394654 or fuehrungen@terra-mineralia.de. Which elements do minerals contain? We already know a variety of minerals at the mineralinos. But what are they made up of exactly? Elements are the building blocks of minerals and can occur in large numbers in them. This is why we will examine the elements in minerals, which we know from everyday life but may not even know that they also occur in the pieces at terra mineralia. The mineralinos, the children’s club of terra mineralia, meet again on Monday 25th November at 4 pm at Castle Freudenstein for an afternoon together. This meeting will be about elements that serve as the foundation stone for minerals. At the “expedition”, the scientific centre of terra mineralia, the girls and boys will learn what elements can be hidden in minerals. Minerals are the building blocks of the earth. Almost all minerals form crystals. Minerals consist of chemical elements. These are arranged according to a strict, fixed body plan, which is different for each mineral. The body plan determines what the crystal looks like. But crystals do not always have enough space to grow unhindered. Very often they hinder each other. “We will try to explain to the children what elements are available in the kit based on examples from everyday life”, says Jan Marc Wargenau, Head of the mineralinos. “Not only minerals, but also we, humans, are made up of elements”. However, which elements are mostly incorporated in minerals and why these are indispensible for people, will be the topic of the mineralinos this month. The mineralinos will meet at the terra mineralia registration desk at Castle Freudenstein. For more information please contact the information desk by telephone 03731 394654 or email fuehrungen@terra-mineralia.de. Not all minerals and rocks that we find on earth come from here. Many of them have a very long journey behind them and arrived by chance on our planet. At the mineralinos this month, you will learn which these are, how one recognises them and what makes them so special. The mineralinos, the children’s club of terra mineralia, meet at Castle Freudenstein on Monday, November 4th at 4 pm, to spend an afternoon together. The meeting will focus on minerals from space. At the “Forschungsreise”, the science center of terra mineralia, the girls and boys will discover a variety of interesting facts about extraterrestrial rocks. Not all minerals and rocks which can be found on earth originate here. Every day, almost 50 tons of rock from space fall onto the earth’s surface. These rock fragments are called meteorites. A lot of them have travelled for a long time and only ended up on earth by accident. Meteorites can tell their own stories. One can distinguish them from other rocks only by a few characteristic traits. But where do meteorites actually come from and how long does their journey take before we can find them on earth? In order to answer these questions the mineralinos go look for meteorites themselves and by this try to find out how meteorites can be distinguished from other rocks. The mineralinos meet at the cash register of terra mineralia at Castle Freudenstein. More information can be obtained through the information desk at 03731 394654 or via email fuehrungen@terra-mineralia.de. We know most sediments like sand on the beach. But what other sediments are there and how different can “sand” actually be. Different colours and shapes tell us how the sediments were formed and where they actually come from. Why do we find sand from the Sahara in Africa in North America and why is the sand on some beaches black?! We will try to find out with the mineralinos. Mineralinos, the kids‘ club of terra mineralia, is going to meet on Monday, September 30, at 4 p.m. at Schloss Freudenstein for another afternoon spent together exploring the diversity of sediments. The girls and boys will learn a lot about sediments in an exploration expedition (“Forschungsreise”), at the scientific centre of the terra mineralia. Sediments are depositions that develop through ice, rain, snow, heat or wind. A typical sediment would be the sand found by the sea. Even though it is hard to believe, every little particle of sand is the leftover of a once massive mountain. But what other sediments are there and how diverse can sand be? Different colours and formations tell us about the origin as well as the development of the sediments. Why do we find sand from the African Sahara in North America and why is some beach sand black? It can be very interesting to collect different kinds of sand – upon comparison they show the diversity of as well as the sometimes obvious differences between the various types of sand. The little mineralinos will learn how to recognise and determine different kinds of sediments – maybe they will take a liking and become collectors themselves. Jan Marc Wargenau, student at the TU Bergakademie Freiberg, will show them what to consider when classifying sand and sediments. People collect all kinds of things: teddy bears, dolls, stamps or even minerals. But what should one keep in mind as a collector? How do I build up my own collection? Do I need order in my collection? With the help of toys and everyday objects, the mineralinos will learn how to describe an object, which minerals it contains and how to bring system to a collection. Mineralinos, the children’s club of terra mineralia, will meet at Freudenstein Castle on Monday, 26 August at 16h00. The theme of the meeting is ‘collecting‘. For this purpose, the girls and boys will visit the Mineralogical Collection of Germany in the neighbouring Krüger House. Children are known to be the biggest collectors – whether it is soft toys, stamps, football cards, Pokémon or stones. They will collect everything. Yet, where does this urge to collect come from? For how long have people been collecting and why? Is collecting innate and absolutely necessary? The mineralinos learn how to proceed in collecting minerals. First, the exhibits must be labelled correctly: In addition to the name, the exact archaeological site and country should also be included. The second step is to ensure that the collection is strictly organised, in order not to lose track. The young collector, Jan Marc Wargenau, a student at the TU Bergakademie Freiburg, will explain how to establish a collection concept, and what should be observed. The mineralinos will meet at the pay point of terra mineralia in Freudenstein Castle, from where they will proceed to visit the Mineralogical Collection of Germany in the Krüger House. For more information please contact the information desk at 03731 394654 or fuehrungen@terra-mineralia.de. The mineralinos are going on a field trip to the mine dump of the Lorenz Gegentrum in Halsbrücke, together with their excursion supervisor. Here they will spend the time searching for lots of treasures. This outing is designed so that the children can apply in nature, what they have learnt about the minerals and identify the minerals they find before they take them home. Participation without these items is not permitted. Parents are welcome to accompany their children and help them to search in the mine dump. The number of participants is limited to 20 children. You can register at the terra mineralia information desk (03731 394654 or fuehrungen@terra-mineralia.de) until Monday, 24th June 2013. Shortly before the end of the school year, the mineralinos will meet at the terra mineralia children’s club on Monday, 24th June 2013 at 4 pm in preparation for the annual field trip on Saturday 29th June 2013. The meeting on Monday serves as preparation for the field trip. It is about setting up a mine and the processes in a mine. Because most of the minerals at terra mineralia are not simply found on the ground - they are found deep within the earth and come from mines from all over the world. But how does a mine actually work and how does one exploit the treasures that are exhibited everywhere? Based on the “Amethyst Throne”, one of the showpieces of the Treasure Chamber, the girls and boys embark on a journey to the mines around the world and all the way back to terra mineralia. The field trip on Saturday then takes the children to the mine dump of the “Lorenz Gegentrum” in Halsbrücke. Here, the girls and boys will search for minerals for their own collections under supervision. Minerals, such as quartz, fluorite or barite are waiting, hidden in the rocks, for the little collectors. The field trip begins at 9 am, and we plan to end at 1 pm. Parents are welcome to accompany their children. The registration list for the field trip is already almost full, but there are still three places available. We know that gemstones are very rare and are mostly used for jewellery because they have such beautiful colours. But where do these amazing colours actually come from and what makes a “stone” a “gem”? This month at the mineralinos we will have a look at these different colours and shapes. On Monday, 25th March, at 4 pm, the mineralinos meet at the terra mineralia children’s club to learn about the explosive power of volcanoes “Volcanoes are fascinating! They are made of lifeless rocks and minerals, but it still seems as if they were alive. In addition to the active Italian volcanoes such as Etna, Stromboli or Vulcano, other destinations also include Santorini in Greece and Piton de la Fournaise in the Indian Ocean. But one volcano is not like any another. The mineralinos will learn how to distinguish them, for example, through their shape or whether they are in the sea or on land. At the mineralinos meeting, the children will also learn how a volcano is built and what happens during an eruption. The mineralinos, the children’s club of terra mineralia, meets on Monday, 25th February at 4 pm to have a look at some German minerals. 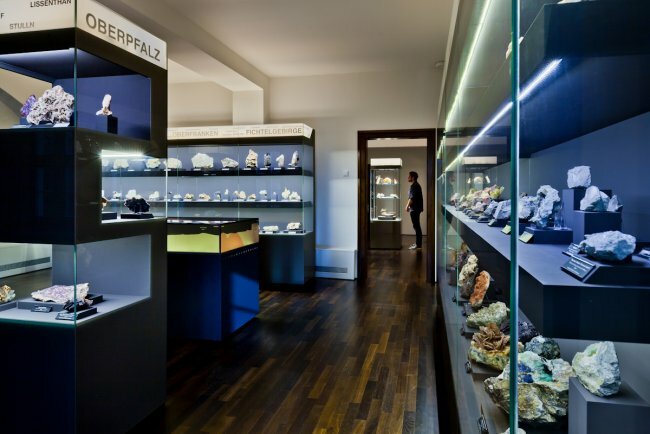 The girls and boys will visit the Mineralogical Collection, Germany at Krügerhaus. At terra mineralia we display minerals from all over the world. 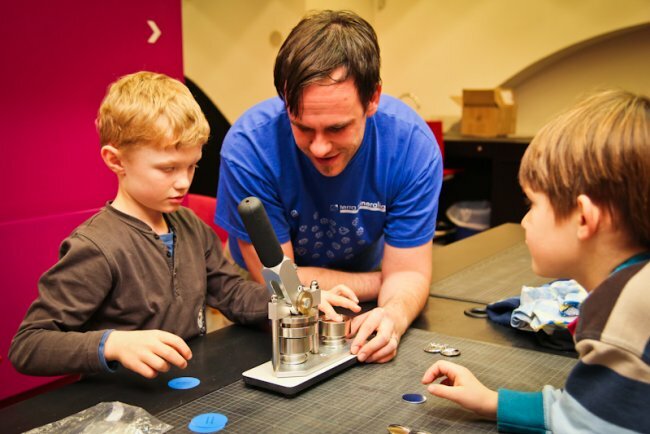 In order for the children to get an impression of what minerals come from their home country, we want to look specifically at minerals from Germany. Of course, in the foreground will be minerals from the Ore Mountains, such as Freiberg silver, galenite, fluorite of various colours, and also erythrite, which contains cobalt, and the large pieces of smoky quartz. A look at other German regions will show the children that diligent searching does not only pay off in the Ore Mountains. An example is the blue hauyne from the Eifel region. Since February, the largest specimen of the rare gem found so far, can be viewed at Krügerhaus. The aim of this excursion is to encourage the children to go searching for minerals by themselves more often. On Monday, 28th January at 4 pm the mineralinos meet for the first time this year. At the terra mineralia children’s club the boys and girls will be shown the amazing journey of rocks. They will learn how rocks are formed and transformed. We want to show the children that rocks such as basalt, granite and gneiss have certain properties according to which they can be easily distinguished. The children already know most of the minerals, such as quartz and feldspar. They are mainly found in rocks. In addition to this we want to show them that the geological cycle is one of the most important processes on Earth. Rocks are formed from magma or lava. Other rocks are changed by the wind and weather on the Earth’s surface. And others, on the other hand, are transformed deep in the Earth’s centre. At the “mineralinos” meeting, the boys and girls will get to know what exciting journeys some rocks go though on this planet. In 2013, the mineralinos meet every last Monday of the month at 4 pm at terra mineralia in Castle Freudenstein. The children’s club exists since 2010. Due to the huge demand, the events continue with Jan Marc Wargenau. The children’s supervisor is 28 years old and is studying geosciences at TU Bergakademie Freiberg in the 13th semester. He specialises in tectonophysics and geochronology. At the Georgius-Agricola primary school he also looks after the “little geologists” group.